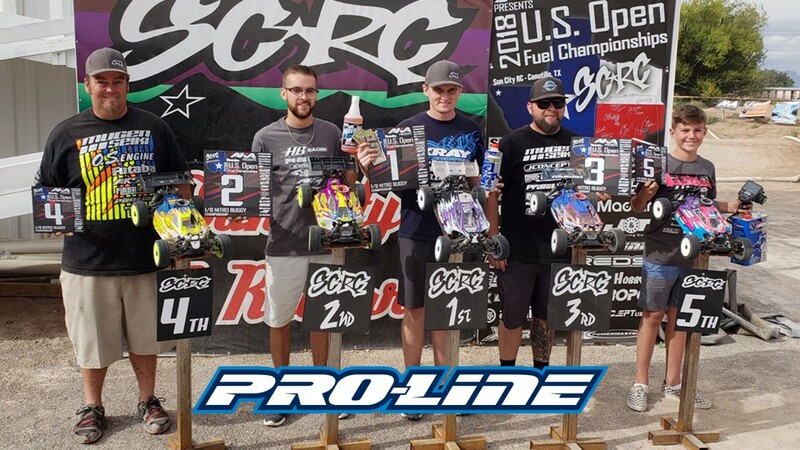 Pro-Line Team Driver Ty Tessmann #1 at 2018 US Open Fuel Championships! This past weekend I attended the 2018 US Open Championship held at Sun City RC Raceway in Canutillo, TX. When we got to the track we saw that the surface was old school, loamy dirt but it was packed well and smooth, but I had a feeling that because of the dirt that it would break up over the weekend. The shape of the track was a little different from the usual, it was 180 x 180 which made the back lanes far away and a little challenging to get through because of the distance. All in all it was a really fun lay out. Friday was open practice, my cars were working good and I was looking forward to qualifying. Saturday there were 3 rounds of qualifying and I was running both E-Buggy and Nitro Buggy. The first round of both classes did not go as I had hoped. The second round of qualifying didn’t go much better so we made some changes to the setup for the 3rd round and it was a much better round in both classes. I would start 4th on the grid for E-Buggy and start 2nd behind Tanner Stees in the even semi for nitro. On Sunday in the A main warm up I did some tire testing and found the grip that I thought I was lacking and I felt much more confident going into the semis. The first main for me on Sunday was the E-Buggy main, starting from 4th I was battling with Cole Ogden and Tanner for 2nd and while this was happening Maifield put a gap on us. Tanner made a mistake and I got by him, I pressured Cole and made a pass on him and then focused on trying to catch Maifield. I would get pretty close at one point but then I was just pushing too hard and because of the bumps and ruts that developed over the weekend I was just making too many mistakes and I would fall back and only finish 3rd. I was determined not to make those same mistakes in the semi and hopefully the main so when my semi came up I focused on driving clean laps, and I was able to win my semi and I would start 2nd behind Maifield on the grid for the main, with Cole starting in 3rd. The main was 60-minutes, so this would be good practice for the worlds. As the main started I was feeling pressure from Cole while trying to stay with Maifield and I started to push a little bit too hard and was hitting ruts that I shouldn’t have been. Cole would get by me and I felt that I was doing the same thing that I did in E-Buggy so I settled down and just drove clean lines and slowly caught up to Cole again and passed him, then Maifield made a big mistake and I got by him and I would continue to create a bigger gap throughout the race and was able to hold onto the lead for the remainder of the race for the win. I want to thank the Showers family for their hospitality and helping to make this race happen for us, thanks to Bailey for helping my Dad pit, Tag for lending us his awesome truck to get around during the weekend. All my equipment worked great, thanks to all my sponsors for their amazing support Xray, RC America, Pro-Line, OS Engines, Hobbywing, MKS, VP Fuel, A Main Hobbies, Protek, Hudy, Lunsford, Avid, StickIt 1, OCRC, Darkside Designs, 110% Racing, Live RC, and Red RC.